Hands On The Keyboard ... Go! Hands On The Keyboard … Go! Remember typing tests in school? Now you can test your own typing scores. But don’t break out the ruler! 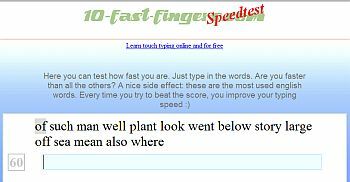 This sixty-second test, developed by 10-fast-fingers.com, feeds you the most used words in the English language. When you’re done, you’ll see how you stack up against all the other people who have taken the test. But we’ll warn you – if you’re competitive, you might try a second round!